In an announcement today, Roadhouse Interactive, 50cc Games and Iron Maiden revealed that free-to-play RPG Iron Maiden: Legacy of the Beast is expected to release worldwide this summer for iOS and Android devices. 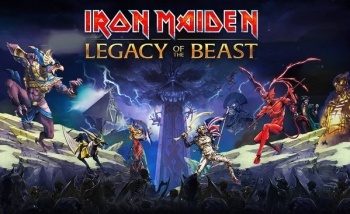 According to the announcement, Iron Maiden: Legacy of the Beast will focus on the band's mascot, Eddie, as he appears in many forms, each accompanied by unique abilities. There will also be time travel, punctuated by an "expansive catalogue" of Iron Maiden albums and art - including unheard live recordings. "As a lifelong fan, I have always thought that Maiden's music, lyrics, and cast of characters would provide the perfect basis for a deep RPG experience," says James Hursthouse, CEO of Roadhouse Interactive. "With this game we're creating an outstanding RPG that will appeal to all mobile gamers, including those discovering Maiden for the first time." "We know many of our fans are gamers and we have long thought that Eddie and Maiden's music and imagery would be perfect for this. It's something we have been looking at revisiting since Ed Hunter way back in 1999," said bassist and founding member Steve Harris. "Now in 2016 it can all be done on a smartphone so it makes it even more accessible for Maiden fans everywhere and also all the gamers out there." "This is the first time we'll see Iron Maiden's lyrical lore and the rich mythology of the record covers brought together in a cohesive universe, exploring Eddie's immortality and inviting players to control his destiny," added Phantom Music creative director Llexi Leon. "The band's signature theatrics and musical drama set the tone for a unique adventure that's perfect for video games." Aside from that, not much else is known of the game. You can sign up for updates on the official website here.